It is National tea day on 21st April – a day where all things tea is celebrated. There is even a festival devoted to it called Fes-TEA-val and in the UK, we are the 5th biggest consumer of tea in the world, sipping around 60 billion cups annually. You may have heard of the physical health benefits of drinking tea, but did you know – there may also be benefits to your mental health too. We’ve compiled a list of our top reasons why having a cuppa is going to benefit your brain and your mental wellbeing. Make yourself a cuppa and have a read. 1: Tea contains caffeine, though not as much as the average cup of coffee. Caffeine is a central nervous system stimulant, which has the effect of opening our airways and getting our blood to pump faster, both of which our brain requires to function optimally, which is why we often feel alert and focused after drinking tea. 2: Caffeine also prevents dopamine, one of our feel-good hormones, from being reabsorbed, which means it hangs around in our system longer, meaning we feel good for longer. 3: Tea, despite the diuretic effects of caffeine, does hydrate us and our brains require good hydration to perform to optimal levels. Just a 10% drop in hydration levels can lead to fuzzy thinking, poorer co-ordination and slower reaction times. Too much and we will overload with caffeine, but 3-4 cups are generally accepted as perfectly healthy to consume – this could be up to half of your hydration consumption requirement per day…and more fun than water! 4: When someone makes you a cup of tea it feels good doesn’t it – you get a little glow of gratitude and pleasure from this small act. But did you know, that ‘feeling’ you’re experiencing is actually a release of serotonin, one of the most important neurotransmitters in helping function well emotionally? When we have a good flow of serotonin (tea is not the only way you can get it – this blog has lots more tips on ways to be happy ) we are most often able to cope, are happy and feel confident. 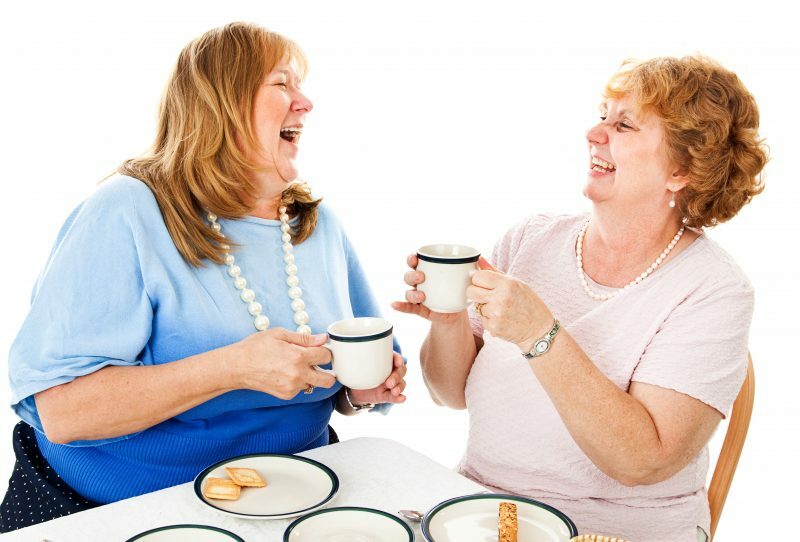 5: Ever stop to wonder why a chat with a friend, over a cuppa, can get you back on track with your day? It is another of those moments of creating serotonin and, if you’re really doing it well, you might even get a little hit of oxytocin in there too. When we have that time of positively interacting, bonding with one another we produce neurotransmitters to encourage us to do it more. Why? Because evolution knows we work better as a tribe, so we get a reward every time we do it. Add to that, our friends often know just the right thing to get us smiling and laughing again (more happy hormones) and you can see how just a quick cuppa really can turn your day around. 6: April is stress awareness month and we are sharing our top stress busting tips all month, one of which is to hit pause on your day. Taking a break to have a cuppa allows your brain to take a break too, which is why you might get to a point in your day when you’re feeling frustrated or overwhelmed and you want to get up and walk away from the task at hand. Having a cup of tea takes a little bit of time to do just that, so that when you come back you’re feeling more in control, because, as well as the other benefits we’ve spoken about, you’ll be back in your intellectual brain – the bit that can get through that work brilliantly. 7: Making tea a bit of a ritual. We aren’t talking full on tea ceremonies here, but we are talking about elevating that few minutes, of time for tea, as something a little bit more special. Even just knowing that you treasure time for tea can make you feel good every time you have a cup, but you can turn it into a few minutes of real mindfulness by picking a favourite cup, allowing the tea time to brew properly (2 minutes according to the scientists who conducted a small study on this very subject , allowing it to cool to just the right temperature, savouring the complex tea flavours. Mindfulness has been shown to benefit us on a physical and mental level, in part by bringing us back into our pre-frontal cortex, our intellectual brain. When we operate from here, we do well and cope well and repeated practice makes it even easier to attain this positive and beneficial mental state. What’s your favourite reason to have a cuppa? About the author: Ali Hollands is a registered, award winning clinical hypnotherapist based in our Maidstone clinic, working with you to eradicate anxiety and outperform your limits. She is best known for her work as a therapist, leading an enACT masterminding group for small business owners and speaking about how the brain works and how to make it work better. Inspired to Change Hypnotherapists are based across the UK in Peterborough, Northamptonshire, Cambridgeshire, Leicestershire, Devon, Norfolk and Kent. Find your local hypnotherapist here. PreviousWear a Flower to Work Day – is it more than just a bit of fun?